Foundation Study Material Class VI to X for Engineering and Medical entrance Exams. Science (Physics, Chemistry, Biology) and Mathematics for PMT / NEET/ AIIMS / Medical Entrance Exams and JEE/Engineering Entrance Exams. 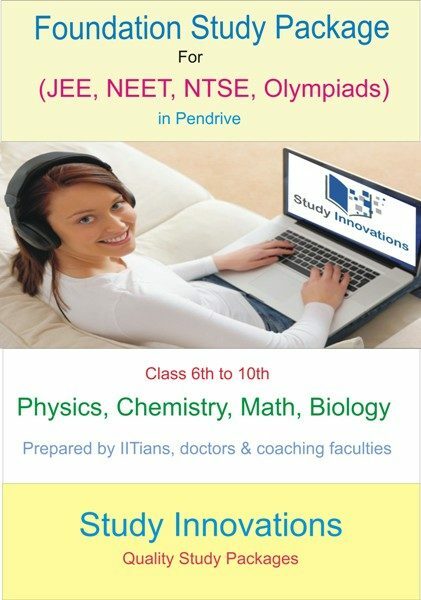 Also highly useful for NTSE, Olympiads & School Exams. -Worksheets, Practice Test Papers (9,000 + Questions). Worksheets include Unit Tests, Topic wise Tests, Subject wise Tests, Science Tests, Math Tests, Term Exam Tests, and NSE, IAPT, IMO, NSO, NSTSE, NTSE Tests etc. -Self explanatory content that can be used by individuals with least amount of guidance. -Prepared by IITians, Coaching faculties and Experts. -Complete Syllabus with all chapters. -No validity limits. Unlimited Validity. -You can study it in your PC / Laptop / Computer for easy access at anywhere, anytime, online or offline. -Student friendly e-Booklets with 8000 + digitized pages in reader friendly format. -Includes both PDF version as well as editable Pagemaker version. -PageMaker Software & PageMaker Key also provided free of cost. -The student needs to study PDF version only. -Highly useful for Students, Teachers, Tutors, Faculties, Coaching Experts, Tuition Centers as you can edit the contents, modify contents, add contents, delete contents and print contents of the package as per your requirement. -Delivered in 16 GB Pen Drive.